Here's my entry for the Less is More Challenge this week where the theme is HEXAGONS. I don't have any hexagon dies or punches so wasn't sure what to do. I then decided to use the computer to print a hexagon to create a frame on some cream linen card - I cut out the middle, edged the hexagon with Olive Versacolour (so I could see where I'd inked) and then heat embossed it with gold. 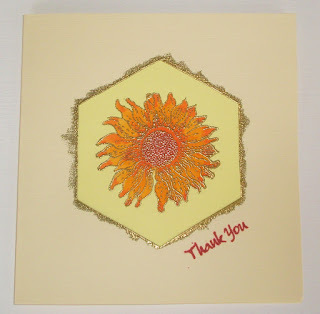 For the insert I gold embossed the Sunflower stamp from Oak House Studio on some yellow card and then watercoloured it with Tombow pens and a water brush. It's just finished with the sentiment stamped in Vermillion Archival. Well I think summer may well be here - our rose on the front of the house is over a fortnight late flowering but the sun is shining and it's supposed to be positively hot tomorrow.....long may it continue!! Thanks for looking and for your comments!! I love that gold embossed edging Elaine, this looks great. Fabulous embossing, love the summery feel to this card. great little ATC, love those bunnies playing.